Local and national renewable energy advocates are saying the country needs to make sweeping changes in how they pay their energy bills. And those changes don’t involve a monthly statement from the power company. They’ll be presenting those ideas during the fourth annual Clean Energy Fair on Saturday in Missoula. In addition to workshops and demonstrations on the latest in residential solar, heat and wind energy systems, Ben Brouwer with Montana Renewable Energy Association, will talk about efforts to expand net-metering programs for electrical energy customers. The Montana legislature approved net-metering in 1999 with nearly unanimous support, allowing bill payers to generate up to fifty kilowatts with residential solar panels and heat pumps, which is more than adequate for most family’s needs. But Brouwer wants the legislature to increase the cap to one hundred kilowatts. He says small businesses, churches, large farms and schools are bumping their heads on those 50 kilowatt caps. He also says it’s time for Montana to allow neighborhoods to generate energy together. "In particularly, we'd like to see the legislature pass a neighborhood net-metering law which would allow multiple utility customers to buy into a community solar array; say on a neighborhood school, a church or a single larger wind turbine on the edge of town; and then receive a credit on their bill according to how much energy the project generates each month, and according to how much of that project they actually own. 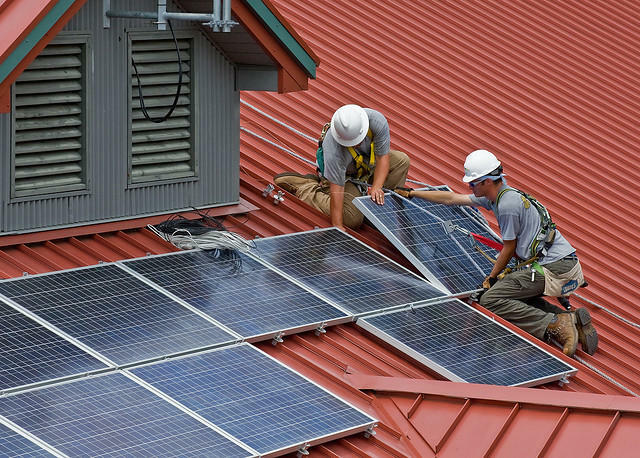 This would be a way for renters, for people with a roof that just isn't right for solar, to actually buy into a renewable energy system and get some benefits on their bills each month." The state Senate killed a neighborhood net-metering bill in February of 2013. Opponents of the bill, including Northwestern Energy, Montana’s largest electric utility, said at the time that the bill would unfairly shift some electricity costs from net-metered customers to other customers who weren’t part of the program. According to Brouwer, "Historically, monopoly utilities like Northwestern Energy have made their money by building big power plants and transmission lines and around the country right now a lot of utilities are looking at rooftop solar as unwelcome competition ultimately affecting their bottom line." Tyson Slocum, with consumer advocacy group Public Citizen in Washington D.C., agrees with Brouwer. He says, "There's a lot of political barriers that are being erected to really unleashing these technology innovations." Slocum will also be presenting during the Clean Energy Fair. He says electric customers across the country have the ability to get off the utility grid and believes renewable energy is a viable option. He say fossil fuels, such as coal, need to phase out a quickly as possible. "Nothing against the hard-working, good folks who are working in very well-paying jobs in the coal mining industry, but the fact of the matter is, there's new technologies that can deliver electricity more affordably, more reliably, and with better value for consumers. And we owe it to our economy to ensure that those technologies have an equal footing in the marketplace." According to the national mining association, Montana ranks 7th in the country for coal production, totalling about five percent of coal mined in the U.S.
Slocum think states can pass legislation that allows people to generate their own electricity without harming households that can’t install solar power. Meanwhile, Montana Renewable Energy’s Brouwer hopes to gather enough support for another neighborhood net-metering bill in time for the state legislative session in 2015. 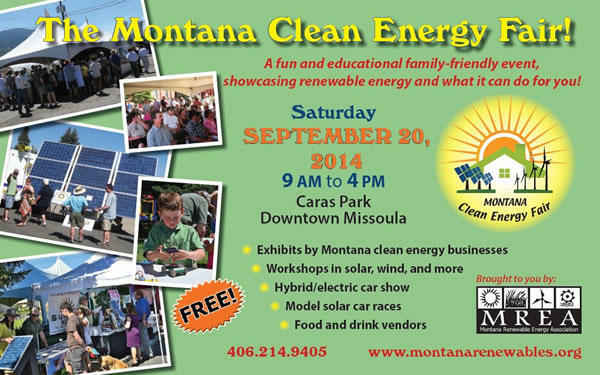 The Montana Clean Energy Fair happens at Caras Park in Missoula, from 9 a.m. to 4 p.m Saturday. There is no charge for admission. Three weeks ago, President Obama laid out his long-awaited plan to address climate change. As he put it in a speech to college students, “I refuse to condemn your generation and future generations to a planet that’s beyond fixing.” Key components of the President’s plan include limiting carbon pollution from power plants and increasing the production of renewable energy. This has major implications for electric utilities across the U.S. The Flathead County Landfill currently has a gas-to-energy project where methane gas is collected to power a generator instead of being burned off. Waste management officials recently learned more about how to use the waste from septic tanks to make trash decompose faster, and produce more energy. St.Clair County in Michigan has about 50,000-septic tanks- residences or businesses not hooked up to a sewer system and therefore using septic tanks to collect their waste. Those tanks need to periodically be pumped. Montanans have tremendous, untapped opportunity to produce clean and valuable wind energy from the windswept, wide-open spaces of eastern Montana. At the same time, growing concern about the long-term survival of sage grouse in Montana and across the West raises the potential for conflict between energy development and habitat protection.